You might remember when Arnt and I collaborated on a cross for Union Gospel Mission in Vancouver. They wanted something made by an artist from the east side that refelected the neighbourhood. 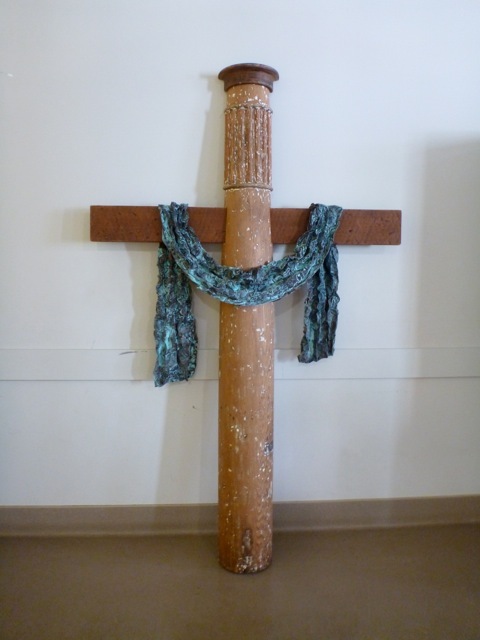 This is the one we made from an old porch column, pattern pieces from Nyes Foundry, a wood joist from our house and we created the shroud from copper and then verdigrised it. It is about 6 feet tall. Well they approached us again to create a smaller one that was similar but not the same for their administration office. 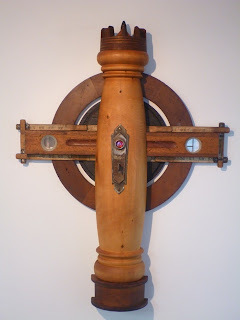 This is what we came up with using a yellow cedar column that Arnt turned on a lathe, Nyes Foundry pattern pieces, an old plane framed by a vintage wood folding measure tape, a door lock from a house on Georgia Street and a skeleton. A little bling was added by using a glass red marble. It is about 30" tall. Humble and regal in one lovely piece!